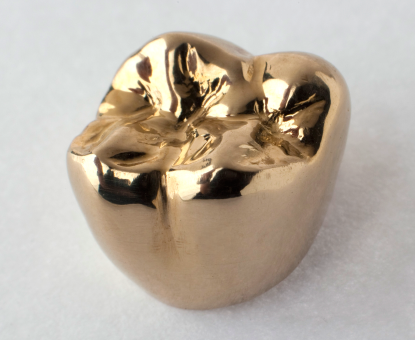 Gold crowns have traditionally been used in the dental industry for many years. Gold crowns can be used for many restorations such as crowns, bridges, inlays, onlays and can consist of either non-precious or precious gold alloys. The NPG restorations are milled while Precious gold crowns are resin printed using state of the art CAD/CAM technology offering optimum accuracy of fit. The key attribute of a gold crown is its longevity, on average, crowns made with gold can sometimes last nearly 20 years and never fracture like porcelain. The preparation required for a gold crown is the simplest and least complicated preparation as there is minimal tooth structure removal. One of the significant advantages of gold is the relative smoothness of the material creating a natural cleanliness limiting bacteria. Gold crowns as a material is also very gentle to the opposing teeth (similar to natural teeth) as opposed to porcelain restorations. Over the long haul this can prevent other significant problems; including back of bite collapse and TMJ problems. Process Designed and milled using CAD/CAM - NPG. Cast - precious.